AcuComm’s ‘Essential’ Gasification Report is out now! The latest addition to the Business Reports series is the ‘Essential’ Gasification issue. Not only does this valuable and insightful report provide unique analysis of over 100 gasification projects and plant developments since 2013, but it also gives you the direct contact information for key decision-makers associated with each in a separate Excel file – information you won’t find anywhere else. 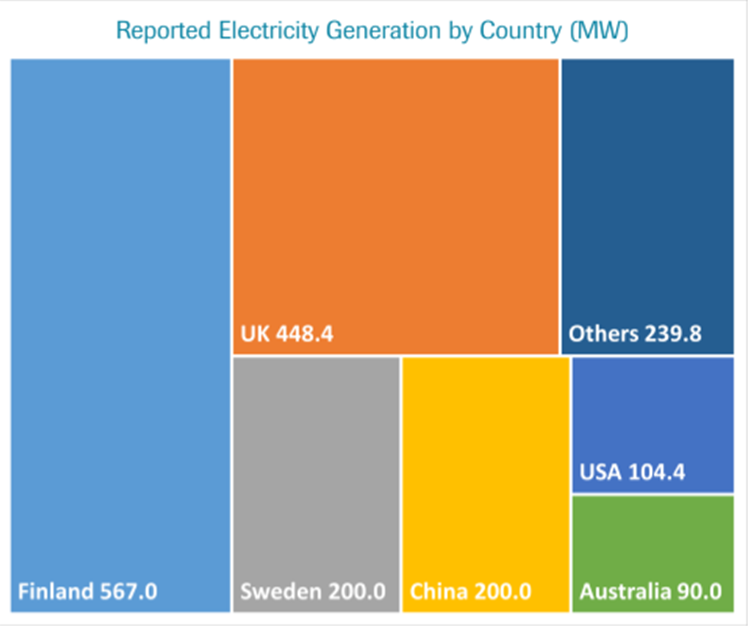 While most reported gasification capacity is in North America or Europe, significant investments in this technology are found all over the world. Environmental legislation has been to the fore regarding moves to boost use of wood-based power sources, especially in the European Union. Gasification represents a more efficient method for this than just simple incineration. Gasification represents one possible future of waste treatment, ideal where space is limited and environmental concerns need to be addressed. Power generation using wood-fuelled gasification is especially popular in Scandinavian countries such as Finland and Sweden. Gasification technologies are also being widely used outside the MSW sphere, using wood-based fuels to generate power. Not only does AcuComm’s Business Report on gasification present the most comprehensive overview of global plant developments since 2013, but it also fuels your CRM with detailed contact information for the key decision-makers associated with specific projects. To order your copy of this essential industry report, click here. In the week ended 22nd November 2015, AcuComm added new or updated projects to our Business db database, worth an estimated US$5,445 million and reported waste capacity of 2.1 million tonnes. This takes the total estimated investment value of projects to US$306 billion. Integrated/mixed facilities accounted for the largest share of reported waste capacity in the past week with just over one million tonnes. The USA was the leading country with 10 projects in total, followed by South Africa and the UK with five each. AcuComm’s Business db is the most comprehensive and accurate source of ‘real-time’ practical sales information for business currently or planning to target the Renewables & Energy from Waste sectors. Through our Sales Package, your organisation’s sales team can access this business-critical information, allowing them to identify and engage with thousands of projects from across the world. To find out more and to book yourself a demo today, click here. Is exporting the future for US recycling? Forester Network has recently published an article covering the growing popularity of recyclable exports in the US. It outlines that 50 years ago, the United States generated around 88 million tonnes of Municipal Solid Waste (MSW) each year, but only recycled a mere 6.4% (5.6 million tonnes) of this total. Fast forward to 2010 and Americans had nearly tripled the amount of waste generated to 250 million tonnes, and recycled or composted 85 million tonnes, equal to 34%. Today, it is estimated that each individual in the US generates an average of 4.43 pounds of waste daily, but only 1.51 pounds of this is recycled. A question you might ask is where does this 1.51 pounds go? Well, approximately half of all recycled materials are consumed, disposed, processed and then shipped to users across the world, most commonly to countries such as China, Canada and South Korea. 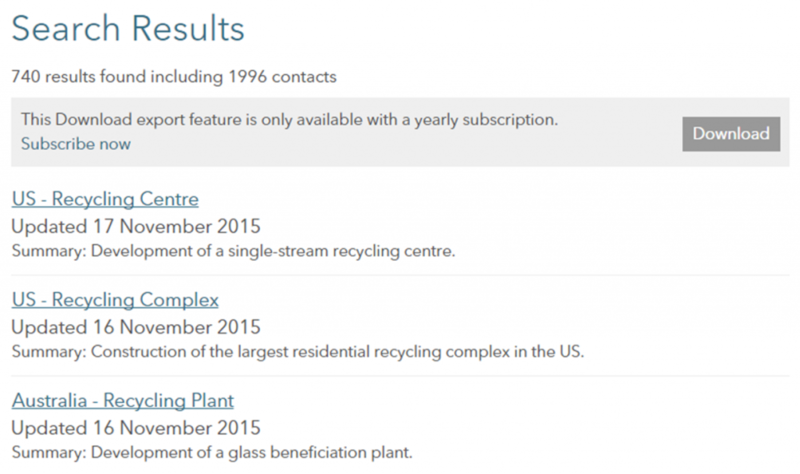 AcuComm’s Business db provides a detailed insight into the recycling industry, both for projects situated in the US itself and for hundreds of others worldwide. Most recently added to Business db include developments located in Las Vegas, NV, and Davenport, IA. Both projects are set to recycle a variety of materials upon completion, including glass, paper, MSW and more. Assessing the different materials being reproduced and shipped internationally allows us to paint a picture of the entire industry and look at how certain recyclables fit into the export market. For example, in 2010, 63.5% of paper in the US was recovered for recycling, and 40% of this was exported to China and other nations. China’s papermaking industry had skyrocketed to the production levels of 93.83 million tonnes in 2009 and continues to grow today. But with the shortage of paper fibre resources, dependency on recycled paper is steadily rising also. Highlighting the importance of this is international trading company, Newport CH International LLC, which focuses on the direct export sale of wastepaper for the recycling industry. Currently, 98% of their business involves exports, with roughly 85% being sent to China. AcuComm’s business intelligence places it in a unique position to inform you on the ever-developing global recycling industry through the projects in Business db and our marketing leading sector reports. Our recent US Business Report exemplifies this. It contained nearly 150 recycling projects with detailed project information and insights. With more global recycling projects being added to our Business db database every week, if the recycling sector is relevant to your business, make sure you register for AcuComm’s weekly project update. You can also see the full list of projects here. We recently came across an article about the Columbia 2013 Survey of Waste Generation and Disposition, which found that in 2011, the US generated a total of 389 million short tonnes of Municipal Solid Waste (MSW), corresponding to a per capita generation of 1.3 short tonnes. Of this total, 63.5% was landfilled, 22.6% was recycled, 7.6% used as fuel in Waste-to-Energy (WTE) and 6.3% composted. Although the US still sends the majority of its MSW to landfill, AcuComm has found that this proportion in slowly reducing, accounting for 52.8% of the total in 2013. The reductions in landfill are largely due to an increase in recycling, which in 2013 accounted for 25.5% of total waste treatments. As of May 2015, AcuComm’s Business db database held over 400 active waste projects across the USA, with the largest proportion of projects (33.2%) involving recycling. In a hierarchy of waste management for the US, the highest priorities are to increase recycling and reduce the waste generation per person. A number of States have adopted various source reduction programmes, including exchange services and pay-as-you-throw charges. It has been found that this metric depends on economic development and culture, as proven by the fact that per capita generation of MSW in the US is substantially higher than in countries with similar GDP per capita, such as Switzerland, Austria and the Netherlands. 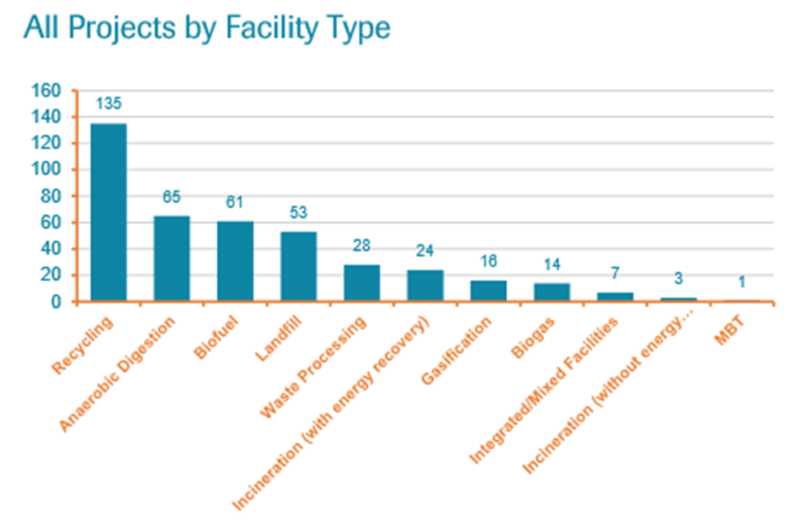 However, it’s not just recycling and landfill that are of focus; projects involving methods such as anaerobic digestion, biofuel generation and WtE incineration are all widely used. AcuComm’s in-depth United States Business Report provides an unrivalled insight into all of these waste management methods and trends with national and state-by-state data. 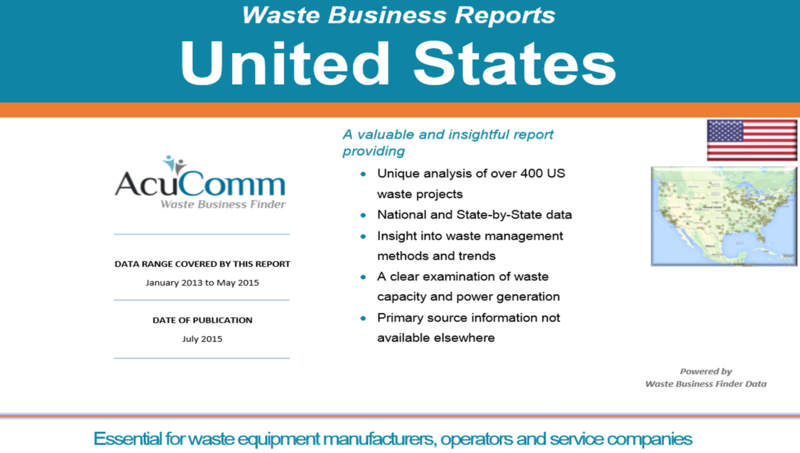 If your business does or has plans to sell into the US Renewables & Energy from Waste Market, take a look at the US Business Report, specifically designed to give organisations the business critical intelligence needed to develop effective growth and development strategies. For enquires and to book a demo, contact Stuart Gamble today on +44 (0) 1243 813695. In the week ended 15th November 2015, AcuComm added new or updated projects to our Business db database, worth an estimated US$3,430 million and reported waste capacity of 2.9 million tonnes. This takes the total estimated investment value of projects to US$307 billion. WtE incineration was the largest category of the past week, accounting for just under one million tonnes. The leading country was the USA with ten projects, followed by the UK with six and Australia with four. In the week ended 8th November 2015, AcuComm added new or updated projects to our Business db database, worth an estimated US$2,596 million and reports waste capacity of 2.7 million tonnes. This takes the total estimated investment value of projects to US$287 billion. Plant biomass accounted for the largest share of projects by feedstock type in the past week, with an annualised figure of just over 0.6 million tonnes. The leading countries of the past week were Argentina and the USA. AcuComm’s Sales Package, designed for the sales team, provides all the information needed to identify and engage with the projects that matter to your organisation. It’s the only source of ‘real-time’ practical sales information from the Renewables & Energy from Waste sectors and is used by leading suppliers from across the world who are looking to gain access to the latest sales opportunities before anyone else. To find out more, get in contact with us to arrange a demo today. 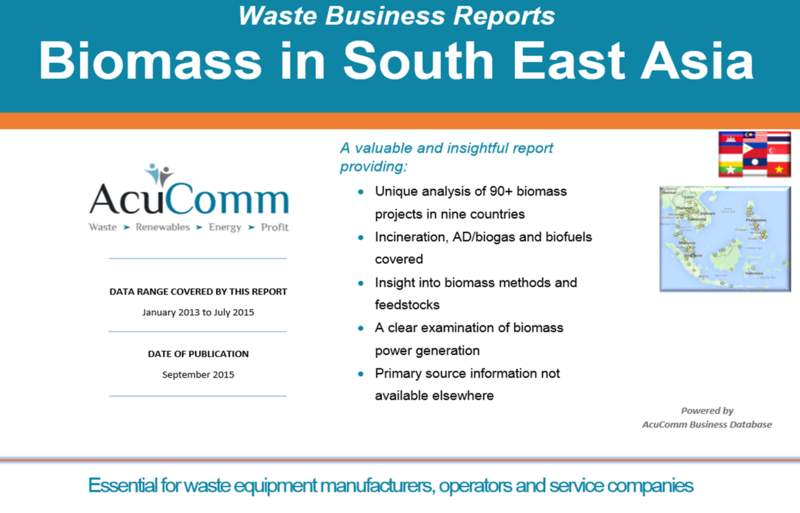 AcuComm’s most popular Business Report this week was the edition on Biomass in South East Asia. Business Reports put major sectors under the spotlight to give in-depth and detailed global market analysis on the key projects from the Renewables & Energy from Waste sectors. This information is vital for organisations selling into the industry who are interested in both current and historic projects. To find out more and to book a demo today, click here. In the week ended 1st November 2015, AcuComm added new or updated waste projects to our Business db database, worth an estimated US$4,112 million and reported waste capacity of 4.6 million tonnes. This takes the total estimated investment value of projects since 2013 to US$287 billion. WtE incineration was the largest category in terms of waste capacity, accounting for just over 3.5 million tonnes. The leading country from the past week was the USA, followed by Croatia. Why are leading suppliers to the Renewables & Energy from Waste sector using AcuComm’s Sales Package as an integral component of their sales process? Want to find out more? Book a demo today.